I'm actually not a massive fizzy drink person, I will have it now and again when I fancy It. I'm actually tying to cut my caffeine so I'm super weary of sports drinks. What puts me off is the amount of calories and sugar they can contain. I'm currently battling with insomnia so I'm finding it so hard with both kids it being the summer holidays. 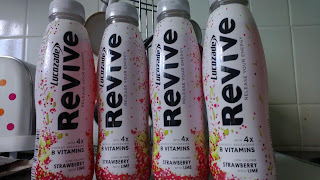 I was sent some samples of the strawberry and lime revive from Lucozade to try and write my thoughts on it. During my working hours before the children as born and my 7am till 6pm shifts I lived on orange Lucozade, it use to get me though my day and recharge me for the day ahead. Since then Lucozade have brought out new and improved flavours with alot less calories! Lemongrass with Ginger, Cranberry with Acai, Orange with Acai, and Strawberry with Lime and they we only 50 calories per bottle. Revive from Lucozade is the perfect guilt-free summer drink. It has 75% less sugars than a normal energy drink. Packed with energy releasing B-vitamins, this lightly sparkling drink can help you cool down, leaving you feeling refreshed and revitalised to help you beat the 3pm slump. I actually really love the flavour, personally the other three flavours wouldn't appeal to me at all. I liked the extra kick but subtle taste of lime. It has given me slightly a bit of energy and I did feel a bit more awake after about 30 minutes after drinking it. Totally in love its the flavour, its definably going to be added to the shopping list.